I got this mask a while ago with my Ren haul, but with all the skin issues experienced these past months, I had not gotten around using it until recently. I don't have major issues with the size of my pores, but pore clogging and blackheads are one of the banes of my existence. If you tell me about a mask that can sort it out and requires nothing on my side but sitting and waiting for 10 mins, I have to try it! The product comes in a very handy solid plastic bottle with an airless pump, which means that it won't dry out once it is open and it stays very hygienic. You get 50ml in the bottle. Since clay can dry the skin a bit and my cheeks clearly don't need that, I have used this on my T-zone only, mainly on my nose and its sides. Don't make the mistake of applying too much, as you are encouraged to remove this by rubbing it off your skin - it falls down like dust - so that means you can't remove it until it's completely dry and the more you will put on, the longest it will require to get dry. Plus, the product is not going to be any more effective because you use a lot. So all in all, I hardly use a pump to do my whole t-zone and apply a thin layer. About 10 mins later, I rub it off then rinse with water. I never expect miracles from that kind of product, but it does a good job and does not irritate my skin! 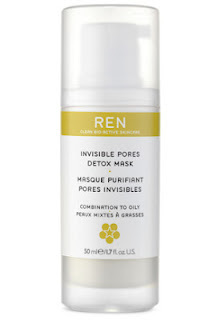 It definitely makes the skin feel soft and the pores a bit smaller and cleaner. All in all, it does a good job. Nice to hear it does a good job!